Katie from the now defunct Good Things Catered came up with this recipe for Chocolate Chip Banana Bread, which utilizes a package of vanilla pudding mix, giving the bread a lot of moistness and great flavor. It is my new favorite recipe for banana bread. 1. Preheat oven to 350 degrees and prepare loaf pan. 2. In medium bowl, combine all flour but 2 Tbsp, baking powder, baking soda, salt, and pudding mix. Whisk to combine and set aside. 3. In small bowl, combine remaining flour and chocolate chips, tossing well to combine and set aside. 4. In bowl of stand mixer, combine shortening and sugar. Beat on high until light and fluffy, about 2 minutes. 5. Add eggs, one at a time until thoroughly combined. Add milk and vanilla, then the mashed bananas, and combine well. 6. With mixer on low, add flour mixture until just combined then fold in chocolate chips. This looks DIVINE! Next time I have ripe bananas I’m making this. I LOVE Katie's recipes (and banana bread, so it's the best of both worlds). This looks so delicious! I will have to bake it soon. Awww! I'm SOO glad you liked it. I'd have to say I probably ate 3/4 of this loaf myself (whoops!) so I agree it's a good one. lol. Veggie - Me too! I love all her recipes. Jewel - Thanks! I hope it turns out well for ya. Amy - Thanks!! I hope you enjoy that blog as much as I do. Katie is an inspiration! Ooohh, I know that pudding mix always makes cakes so moist. I never thought to try it in a quickbread. Your bread must really have been tasty. This looks so good, I will try it very soon! This sounds delicious!! But could could I use something else other than shortening? Just made it! I added a little bit of cinnamon and nutmeg just to add some spice, but it is so delicious and moist! Just made it! I added a little nutmeg and cinnamon for some spice. It is so delicious and moist! I made this bread today and it is delicious! 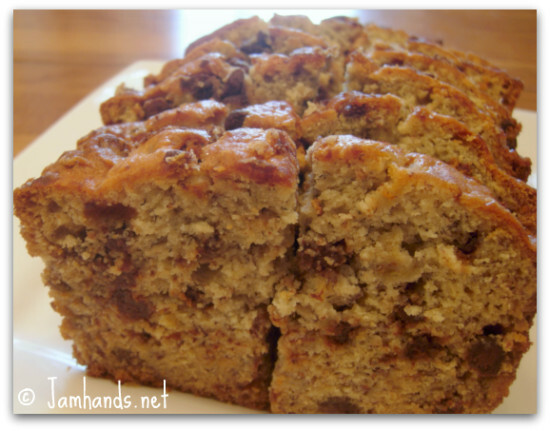 I have made several different versions of banana bread and this is by far the best. I added a little cinnamon to the flour mixture and I lined the pan with parchment paper (paper slightly hanging over the sides.) Just makes it a little easier to remove from the pan. Thank you for posting this recipe! Definitlely a keeper. I'm glad to hear that you enjoyed the Banana Bread. Parchment paper is a great idea! I need to start using it every time I bake, it is wonderful.